Okay, for someone like Sentai in the US, it may be a drip, but for a UK company, and for MVM in particular, announcing three licenses in one week is a deluge, especially as one of the titles will be their first venture into the wild territory of anime on Blu-ray. The news came via Facebook and via Anime UK News that MVM would be releasing Broken Blade, Mayo Chiki, and .hack//Quantum. Broken Blade is to be released on Blu-ray as well as DVD. Broken Blade comprises 6 fifty-minute episodes, and was released in 2010. Mayo Chiki is a thirteen episode series from last year. Kinjirou Sakamachi has gynophobia (fear of women), due to his violent mother and sister. Subaru Konoe is the butler of his classmate, Kanade Suzutsuki, and has to dress as a male due to butlers having to be men. When Kinjirou discovers Subaru's secret, Kanade promises to cure Kinjirou of his phobia. Kinjirou and Subaru are forced due to circumstances to spend time together and defend Subaru's secret while trying to cure Kinjirou's fear. .hack//Quantum is the most recent 3-episode OVA series in the .hack universe, again released in 2011. Series summaries from Anime News Network. Interestingly, while .hack//Quantum has been released by Funimation, and Sentai released Broken Blade last Monday in the US, Mayo Chiki is yet to be licensed in the US, leading some to speculate that MVM may be venturing into sub-only territory as well. The Anime UK News site also states that MVM have a further two licenses yet to be announced. Manga Entertainment released K-ON! last year to the delight of many fans, tempered by its Blu-ray woes. But that silver lining had a cloud, when Bandai Entertainment, who had dubbed and released K-ON! in the US went out of the distribution business. 'Where was the second series going to come from?' lamented all the Light Music Club fans. Well last week saw the welcome news that Sentai Filmworks has licensed the second series, K-ON!! (it's all in the number of exclamation marks), which means 26 episodes + 1 OVA of more Light Music antics will make it to Western shores. Even better news for dub fans, Sentai have retained Bang Zoom, who dubbed the first series to work on the second. It's too early to say if this will be licensed for the UK though. Next, the movie! From Crunchyroll came the remarkable news that Japan's Madhouse Studios, specialising in animation like Black Lagoon, and High School of the Dead, have been selected to animate none other than the Peanuts gang. Charlie Brown, Snoopy, Woodstock, Linus and Lucy are going to be in their very own anime! It will be interesting to see just how this classic US national treasure will fare given an anime makeover. I bet Snoopy winds up piloting a giant robot! Bleach Good News and Bad News, Or Is That Good News and Good News? Two little snippets of Bleach news popped up last week, which will be of interest to fans. First is that after some 300 or so episodes, the Bleach anime is to come to an end. The final episode will air on March 27th, and it ought to be noted that the manga has only just started its final arc, so the TV ending won't be canon (or it may just be a lengthy hiatus). The second bit of Bleach news is that Warner Brothers are after the movie rights to the manga series with one eye on creating a feature film, or potentially a series of feature films. Given how work is proceeding apace on Death Note, Akira, Ninja Scroll, Cowboy Bebop, and all the other Hollywood live action anime adaptations that are happening (ie it isn't), I'm inclined to think this is just another one of those accounting exercises that studios engage in to confuse tax collectors. After this New Year, it seemed that the anime industry was about to eat itself, but a good news week like this almost makes me optimistic and cheery again. 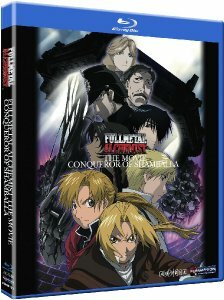 And there are reviews as well, beginning with my look at Full Metal Alchemist: The Conqueror of Shamballa on Blu-ray. It's one of my wholesale double-dips from last year, when I went all high definition. You're going to have to import it for now, as it's not available in the UK. Funimation in the US did release it on a Region AB disc, which makes it work on all our UK Blu-ray players. It's the feature film conclusion to the first anime series called Full Metal Alchemist, and has nothing to do with Fullmetal Alchemist: Brotherhood, or indeed the forthcoming Sacred Star of Milos movie, but it still remains one of my favourite anime feature films after all this time, so much so that I've reviewed it for the third time. To conclude, I took a look at something new and shiny in the UK market, Fairy Tail: Part 1. It's the latest long-running action adventure series, sitting comfortably alongside similar offerings like Bleach and Naruto. Unlike those two titles though, Fairy Tail has a much stronger comedy core to it. Its tale of wizards buying and selling their magical skills in a strange far-off land is played more for laughs, and its bright and colourful sensibility has much more broad and open appeal to it. The first twelve episodes introduce wannabe wizard Lucy Heartfilia, the travelsick wizard Natsu, the naturist antagonist Gray, the fearsome attitude of Erza, and the happy sidekick Happy. If its fun and frolics are par for the course, then hopefully Fairy Tail will become as constant a UK presence as Naruto or Bleach. 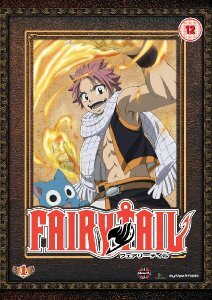 Funimation released Full Metal Alchemist: The Conqueror of Shamballa on Blu-ray back in 2009, while Fairy Tail: Part 1 comes out on March 5th 2012, courtesy of Manga Entertainment.